Madison Prenger worked on a memory book before bidding farewell to friends she made from around the world while in Modena, Italy. Madison and Abigail traveled to Italy through an international peace organization named CISV (Children’s International Summer Villages). They are the daughters of Eric and Trisha Prenger of Anna. Before leaving Rome, Abigail Prenger said goodbye and exchanged contact information with an adult chaperone from China. Madison and Abigail traveled to Italy through an international peace organization named CISV (Children’s International Summer Villages). They are the daughters of Eric and Trisha Prenger of Anna. 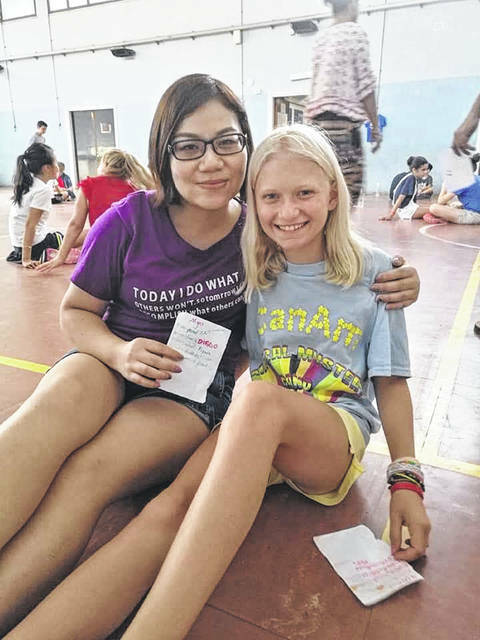 ANNA —	Sisters Madison Prenger, 14, and Abigail Prenger, 11, daughters of Eric and Trisha Prenger of Anna, spent part of their summer abroad in Italy through a program named Children’s International Summer Villages (CISV). The Prenger family are members of the local CISV Miami County chapter located in Troy, Ohio. CISV’s mission is to educate and inspire action for a more just and peaceful world. CISV is a global organization dedicated to educating and inspiring for peace through inter-cultural friendship, inclusiveness, enthusiasm, engagement, cooperation, and understanding. Madison participated in a 23-day Step Up program intended for 14-15-year-old children in Modena, Italy. She traveled with an adult chaperone and three other teenagers that made up the USA delegation. Other delegations at camp included teens from Ecuador, Germany, Israel, Italy, Netherlands, Norway, Poland, Vietnam, as well as staff members from Italy, France, and Mexico. While at Step Up, Madison traveled to a nearby park and met with multiple refugees from war-torn Western Sahara in northwestern Africa as part of the camp’s Local Impact Day. “Our Local Impact Day was very eye-opening for all of us, and it makes me appreciate the freedom and privileges that I often take for granted,” said Madison. Madison’s Step Up group also met up with other Italian Step Up groups from Padova and Reggio Emilia to collaborate on a service project. 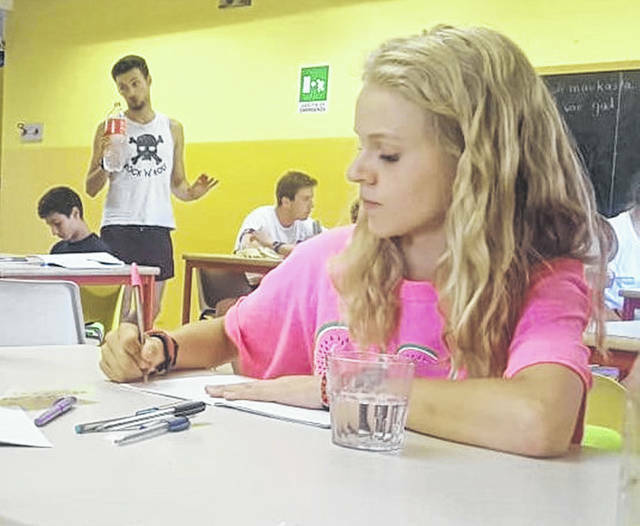 Abigail participated in a 28-day Village program designed for 11-year-old children in Rome, Italy. She also traveled with an adult chaperone and three other children from the Miami County Chapter as part of the USA delegation. Other delegations at Abigail’s Village included children from Brazil, China, Costa Rica, France, India, Italy, Latvia, Norway, Portugal, Spain, and Thailand. The Village also consisted of Junior Counselors and staff from Austria, Canada, Colombia, Italy, Jordan, USA, and Vietnam. While at Village, Abigail was able to experience true Italian culture when staying with three separate host families. During Open Day, when members of the local community are invited to experience a display of each country’s cultural uniqueness, the entire camp was greeted by Rome’s mayor, Virginia Raggi, who is a former CISV Village participant. Raggi said she was delighted to return to a Village as an adult. Abigail’s delegation also experienced excursions to the Colosseum, Trevi Fountain, Vatican City, a local beach, shopping, and lots of Italian-style ice-cream called gelato. “I’m glad I was able to participate in Village because it’s the most incredible thing I’ve ever done!” said Abigail. Even though their Step Up and Village experiences have concluded, thanks to current technology and social media, both girls are able to remain in contact with the friends they made from around the world this summer. Since returning from Village, Abigail has taken an interest in learning the Portuguese language in hopes of visiting Brazil in the future. Madison is interested in learning more about different customs, religions and cultures of even more countries. Both girls look forward to attending monthly chapter meetings and CISV camps in the future at local, regional, national, and international levels. Founded in 1950 in Cincinnati, Ohio, by University of Cincinnati psychology professor, Dr. Doris Twitchell Allen, CISV currently consists of 26 chapters across the USA and more than 200 chapters scattered throughout 69 countries around the world. Following the devastation of World War II, Dr. Allen believed that peace would be possible through children. From this conviction came her vision of bringing together children from all over the globe to learn to respect different and common values. In 1951, she realized her dream when delegates from eight countries gathered in Cincinnati for the first Children’s International Summer Village (CISV). Over the decades, the organization has grown in numbers, countries, and activities. In 1979, Allen was nominated for the Nobel Peace Prize – the recipient that year was Mother Teresa. Throughout its 68 years of existence, CISV has given more than 10,000 children and young adults the experience of their lives and the opportunity to build lasting friendships through its international education programs. Each year, the organization focuses on one of four educational content areas including diversity, conflict resolution, human rights, and sustainability. Chapter activities are planned and implemented based on the year’s focus, and for 2018-2019, the theme will be conflict resolution. https://www.sidneydailynews.com/wp-content/uploads/sites/47/2018/09/web1_Madison-Prenger-Press-Release-2018.jpgMadison Prenger worked on a memory book before bidding farewell to friends she made from around the world while in Modena, Italy. Madison and Abigail traveled to Italy through an international peace organization named CISV (Children’s International Summer Villages). They are the daughters of Eric and Trisha Prenger of Anna. https://www.sidneydailynews.com/wp-content/uploads/sites/47/2018/09/web1_Abigail-Prenger-Press-Release-2018.jpgBefore leaving Rome, Abigail Prenger said goodbye and exchanged contact information with an adult chaperone from China. Madison and Abigail traveled to Italy through an international peace organization named CISV (Children’s International Summer Villages). They are the daughters of Eric and Trisha Prenger of Anna.